Definition at line 42 of file ndn-net-device-transport.hpp. Definition at line 37 of file ndn-net-device-transport.cpp. 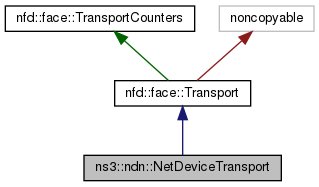 References ns3::ndn::L3Protocol::ETHERNET_FRAME_TYPE, nfd::face::Transport::getLocalUri(), nfd::face::Transport::setLinkType(), nfd::face::Transport::setLocalUri(), nfd::face::Transport::setMtu(), nfd::face::Transport::setPersistency(), nfd::face::Transport::setRemoteUri(), nfd::face::Transport::setScope(), and nfd::face::Transport::setSendQueueCapacity(). Definition at line 80 of file ndn-net-device-transport.cpp. Definition at line 147 of file ndn-net-device-transport.cpp. Definition at line 86 of file ndn-net-device-transport.cpp.